Leave it to the world’s greatest master manipulator to goad one of the biggest stars in wrestling history into one more match. Paul Heyman may have done the unthinkable which is entice Stone Cold Steve Austin to get in a WWE ring for one more time. The Steve Austin WrestleMania rumors have just started to die down as fans have become resolved with the idea that the Texas Rattlesnake is never coming back. While Austin has never said the word “never”, most assumed after Austin passed up a Mania match with CM Punk that he was indeed done. That was until Austin’s former manager Paul Heyman laid out the perfect scenario. The former ECW mastermind was a recent guest on Austin’s podcast. The conversation ended with both fawning over Brock Lesnar. 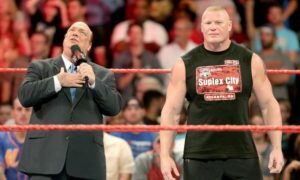 Heyman than brought up that he and Lesnar have had an interest going back to Lesnar’s UFC days in a match with Stone Cold. Heyman proceeded to lay out the scenario, billing the match as the Baddest Man on the Planet vs. The World’s Toughest S.O.B. Austin sat silent until Heyman put him on the spot. After dodging the question as to whether he would be interested he finally admitted to Heyman that he is intrigued. It didn’t take long for word to spread throughout the Internet about Austin’s interest in such a match. It should be noted that all Austin said was that he was interested with Heyman doing most of the talking. That was enough for pro wrestling fans to get excited. But the question is, should you get excited? Is there a real possibility that this match is going to happen? My gut says no. Austin has remained retired from active competition for over a decade. Austin is still in great shape and as we saw a few years back on Tough Enough, he could get in the ring tomorrow and go. As a matter of a fact the WWE were so convinced that Austin could be tempted to come back that they even penciled in a match with him and Triple H at WrestleMania 30. It never happened and most presumed that by this point he was done. Maybe he isn’t done after all? How big would the match be? I think the match would be gigantic. In terms of money it is hard to say because more people will have the WWE Network next year and the buyrates are bound to decline. However, a match like this could still do big business. I would imagine there would be a ton of casual fans that would gladly pay $70 to see this match, yet have no interest in subscribing to the entire network for $10 less. I think you would draw in so many crossover fans that haven’t watched in awhile or don’t buy shows that you’d have the biggest match of our lifetime in Brock vs. Austin. How good would the match be? I think it could be pretty damned good. I think the styles of both guys would mix real well inside the ring. It is tough to say at Austin’s age and ring rust how crisp he’d be in the ring. The only thing I can go on was his workout on Tough Enough and he looked pretty damned solid during that little workout session with Luke Robinson. Brock is Brock and I think a mix of a wrestling/brawl kind of a match, kept under 20 minutes would be the perfect recipe for these two to knock it out of the park. There is always the additional backstory here of Austin’s walkout. Austin walked out of the company in 2002 after he was asked to put Brock over on RAW in a King of the Ring qualifier. Austin has said many times since then that walking out over this was one of the biggest career mistakes he ever made. Everyone knows the story so using it as part of the hype for the match only seems like a a natural to me. But could it really happen? Unlike last year when everyone expected Brock vs. Undertaker at Mania, there is no clearly defined path for him to 31. The Rock is reportedly the working idea but I honestly think you’ll never see a Brock vs. Rock match. There is just too much physical risk to Rock. Cesaro is the other rumored opponent but let’s be honest. With all due respect to my old friend Claudio, I don’t think anyone would expect the WWE to pass on Austin in favor of Brock.